Vegan Red Curry Cup O’Noodles! 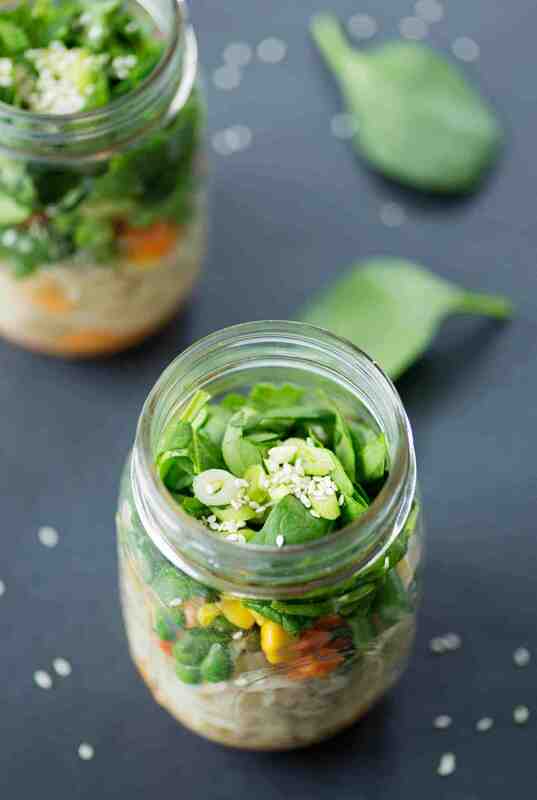 Homemade lunch in a jar! Just add hot water and you’ve got your own DIY Cup O’Noodles. Red Curry, Coconut, veggies, noodles and herbs. Today, we’re upping the ramen game. And, not cool, hipster authentic ramen with poached eggs that you now find on every corner of up-and-coming downtown scenes. I’m talking the ramen that we’ve probably all feasted on at some point (and maybe secretly still do?). A block of dried noodles for $.32, the epitome of college students and bachelors everywhere. Like every good American teenager, I went through a serious ramen phase. I fondly remember coming home from middle school and warming up a block of ramen noodles, creamy chicken variety with extra frozen peas, please. Then, I’d sit down on the couch, overflowing bowl of ramen soup in hand, and sneak soap operas before my mom came home, RIP Sunset Beach. Gosh, I ate that so often, I can almost still taste it. Thankfully, my taste buds have matured since then. I think my last block of ramen noodles happened sometime in college and I’m thankful that phase of ramen-every-day is long gone. These red curry cup o’ noodles are a nostalgic throw back to the styrofoam lunch containers; without any of the nasty ingredients or aftertaste. Just as simple, much more delicious. The base is a mix of red curry paste, vegetable broth, chili garlic sauce, soy sauce and coconut milk. YUM. It’s basically the same mixture you would use to create a curry sauce, in a reduced version. Throw that in the bottom, then start to layer the toppings. You’ll need to cook the noodles first, because even though you are adding in hot water, it’s not enough to actually cook fresh noodles. Layer those in over the sauce, then add in cubes of tofu (raw or dry-fried), vegetables and some scallions for garnish. 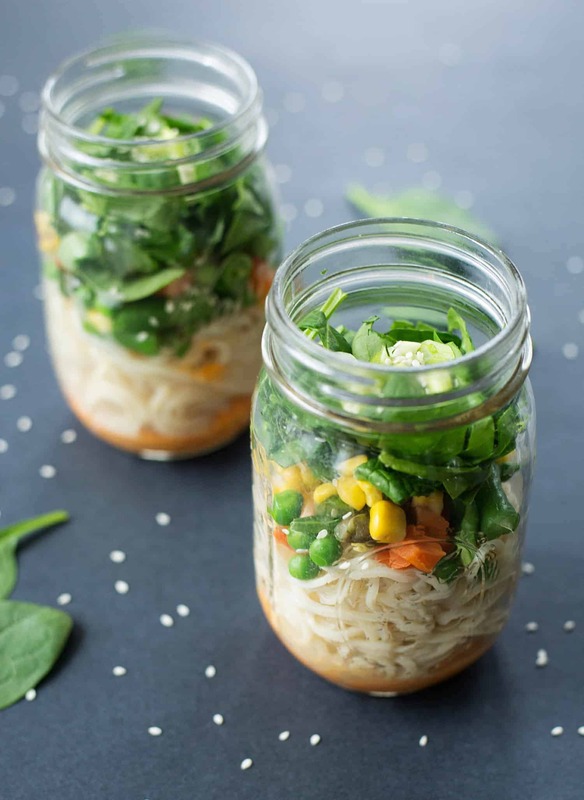 Giving a nod to the traditional cup o’noodles, I’m using a mixture of frozen corn, peas and green beans but your favorite bite-size vegetables with work. Make sure to leave enough room in these jars to allow the hot water to seep in. I’m partial to the quart size but hey, it’s your lunch! Go with whatever size jar works for you. When you’re ready to eat, add in hot water, let sit for 3 minutes, then cover and SHAKE. This is to loosen all of the sauce bits at the bottom so all of the ingredients are covered. Magic right? 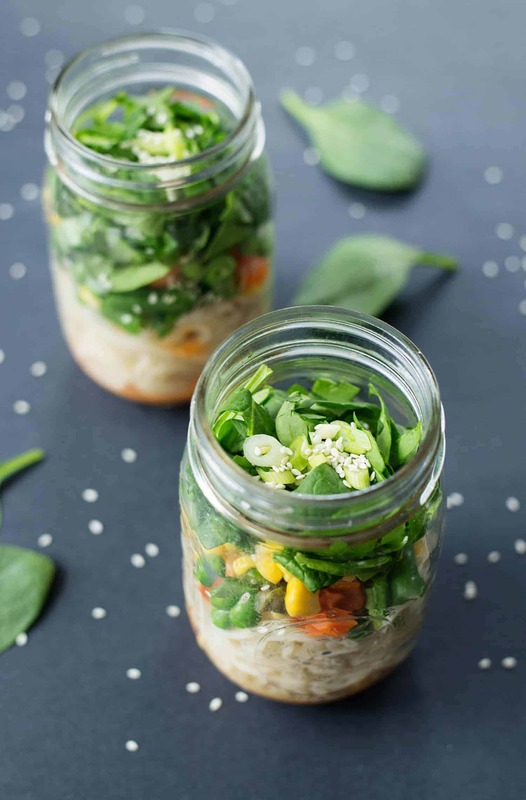 No more sad noodle packages or containers when you’ve got homemade ramen in a mason jar. This is how we lunch post-college. Whisk together the curry paste, bouillon paste, brown sugar, chili-garlic sauce, soy sauce and coconut milk. Place in the bottom of a quart mason jar. Layer the noodles, frozen vegetables, tofu, spinach on top. You don’t want the ingredients to be fully packed as you want space for water to be added. Place the scallions and lime wedge in a small plastic bag or plastic-wrap, squeezing out the air. Place the bag into the jar and cover with lid. Refrigerate for up to 3 days. 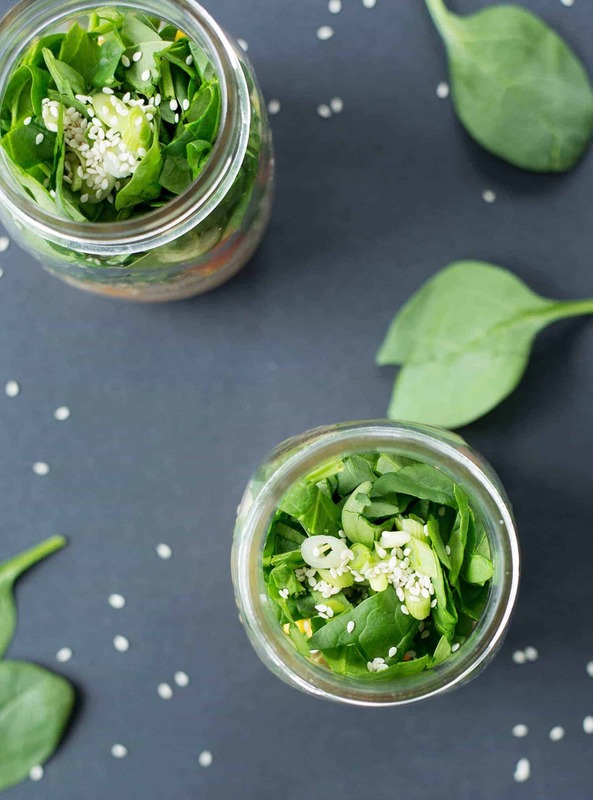 When ready to serve, remove scallion-lime packet and add boiling water to the top of the jar. Seal jar and let sit 2 minutes. Open the jar, squeeze in the lime juice and scallions and serve. Oh man, I love the Sunset Beach reference! I almost forgot about that show! Ha! This looks fantastic Alex! Can’t wait to try it! This recipe looks so delicious and your photos are gorgeous! Makes me want to make this right away!